Q: I am trying to create an Auth or CJA-21 but those options aren’t on the left-hand side of my screen, where they should be. What happened? Q: The expert that I want to use in a case isn’t listed on the drop down menu. Can I still use that person? Q: I submitted a request for funds to hire an expert. How do I know if the request was granted? Q: I am asking for money to hire an expert. Can I just type the reasons in the message section? A: You may have opened an existing voucher, rather than opening the appointment to create a new document. Close the document and go to the Appointment List area (not My Active Documents) of your home page. Click on the case you would like to work in and you should find all the options on the left-hand side of the Basic Information page. Q:The expert that I want to use in a case isn’t listed on the drop down menu. Can I still use that person? 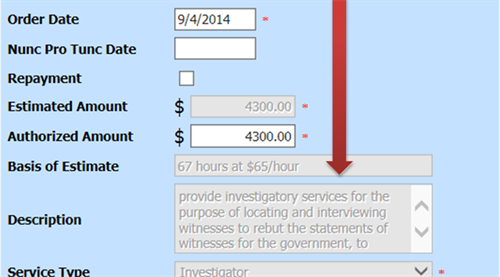 Select the Service Type from the drop-down menu (e.g., investigator, interpreter, etc.). Provide a description of the services that will be provided. In the Expert drop-down box, select the blank. That will cause a number of blanks to appear. Fill in those blanks with the expert’s information. When the expert has been entered into the system, the CJA-21 will be listed under My Service Provider’s Documents. You will then be able to open the voucher and enter the expenses and services for the expert. Q:I submitted a request for funds to hire an expert. How do I know if the request was granted? A: Once an Auth has been approved by the court, it will appear in the Closed Documents area of the attorney's home page. This means that the attorney has received permission to spend the requested amount on the service requested in the Auth. The attorney should then let the expert know that the services have been authorized. Q:I am asking for money to hire an expert. Can I just type the reasons in the message section? A: No. Please enter the reasons and basis for the request in the section on the Basic Information page labelled Description.